Structural Health Monitoring (SHM) is the interdisciplinary engineering field devoted to the monitoring and assessment of structural health and integrity. SHM technology integrates non-destructive evaluation techniques using remote sensing and smart materials to create smart self-monitoring structures characterized by increased reliability and long life. Its applications are primarily systems with critical demands concerning performance where classical onsite assessment is both difficult and expensive. Tadeusz Stepinski is currently a Professor at Uppsala University, and since 2012 has also been a Professor at AGH University of Science and Technology in Poland. He has been active in the area of non-destructive testing and signal processing since the 1980s and has authored circa 140 technical publications. Tadeusz Uhl is a Professor at AGH University of Science and Technology in Poland. His main research areas are system identification, inverse problems, SHM and mechatronics. He has written circa 300 technical papers. Wieslaw Staszewski is a Professor at AGH University of Science and Technology in Poland. 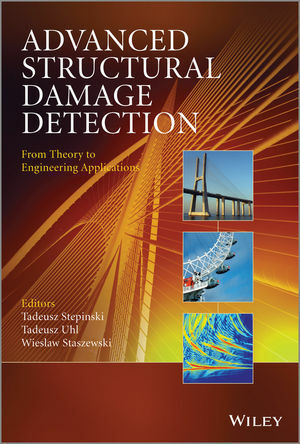 He has authored circa 280 publications, predominantly in the areas of damage detection and advanced signal processing. He has written and edited a book, authored circa 90 journal papers and is also an editor and associate editor of five journals. He was jointly awarded the "2004 Person of the Year" title by Structural Health Monitoring journal for outstanding contribution in the field of SHM.